Dogs have been my favorite pet since I was a small kid and I think my kids inherited those genes from me. They kept on asking me to have a pet dog 24/7. As I also would like them to be responsible pet owners someday, I gave in and got them a dog. I browsed through the pages of Dubizzle and found this 7-month-old puppy for adoption. His former owner was leaving and would not bring him along that's why he posted him up for adoption. 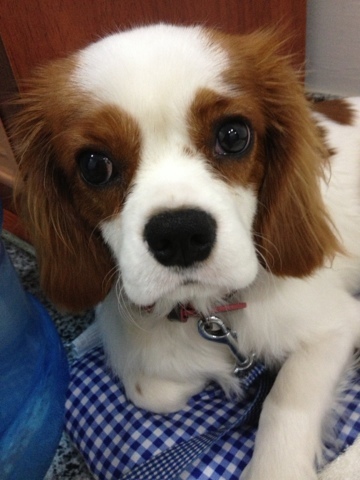 The former owner posted Cavalier King Charles Spaniel puppy for adoption. I did not have any information about this dog's breed at all, but when I saw his pictures, I fell in love with him immediately. Those gorgeous eyes can really take your breath away. 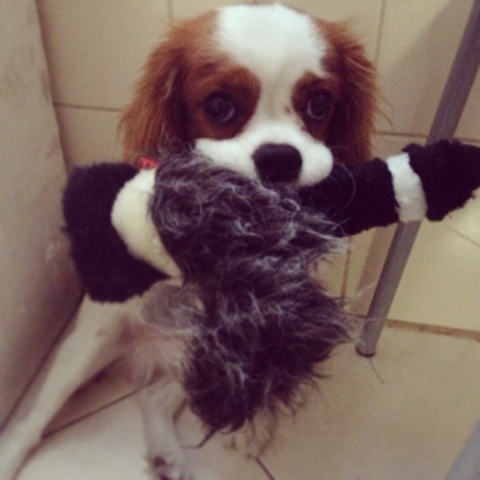 According to Wikipedia, "Cavalier King Charles Spaniel is a small spaniel classed as a toy dog by The Kennel Club. It is one of the most popular breeds in the United Kingdom. Since 2000, it has grown in popularity in the United States. It is a smaller breed of spaniel, and Cavalier adults are often the same size as adolescent dogs of other spaniel breeds. It has a silky, smooth coat and commonly a smooth undocked tail. The breed standard recognizes four colours: Blenheim, Tricolour (black/white/tan), Black and Tan, and Ruby. The breed is generally friendly, affectionate and good with both children and other animals; however, they require a lot of human interaction. The King Charles changed drastically in the late 17th century, when it was interbred with flat-nosed breeds. Until the 1920s, the Cavalier shared the same history as the smaller King Charles Spaniel. Breeders attempted to recreate what they considered to be the original configuration of the breed, a dog resembling Charles II's King Charles Spaniel of the Restoration. Various health issues affect this particular breed, most notably mitral valve disease, which leads to heart failure. This appears in most Cavaliers at some point in their lives and is the most common cause of death. The breed may also suffer from syringomyelia, in which cavities are formed in the spinal cord, possibly associated with malformation of the skull that reduces the space available for the brain. 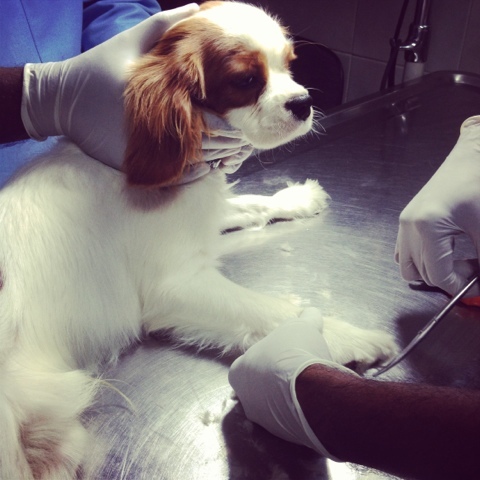 Cavaliers are also affected by ear problems, a common health problem among spaniels of various types, and they can suffer from such other general maladies as hip dysplasia, which are common across many types of dog breeds." Having a dog in the Philippines back in the day was different. Before, dogs were only considered as a "guard" and not as a pet, were put on a leash or a cage and not free to roam around. The food they had were only left overs and not proper dog food. 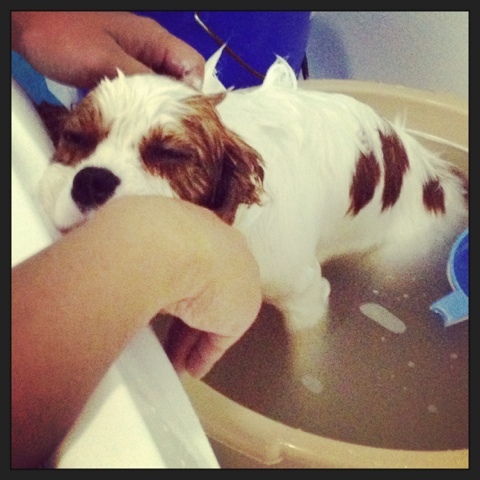 We gave them baths daily using detergents, which is bad for their skin. We did not let them inside the house, as we were afraid that they will poop or pee anywhere. Horrible - yes, I know. As I have been living in the UAE for almost 10 years now, I came to observe how other nationalities take care of their pets - be it dogs or cats. I will not call our ways before cruel - I would rather call it "lack of education" on how to take care of pets. It can also be lack of financial resources, if I may say. But now, having been educated through observation and reading, we are taking care of Charlie not the typical Philippine way. He now has his own dog food, is not on a leash (except when we have to go out) or cage, takes a bath every week with his dog shampoo, and gets a regular visit to the vet. Keeping a dog demands a lot of committment. Charlie is not 100% house trained, but he is getting there. We have to bring him down at least four times a day to do his thing. No matter what we do, he will not do his thing in the balcony. He prefers the spacious greenery near our flat. It is very tasking but rewarding at the same time especially when I see the smiles on my kids' face whenever they play with Charlie. Charlie may cause a few more holes in my pocket but is definitely worth it.